Pete Maravich and Alllen Iverson are generally regarded as all-time great scorers. 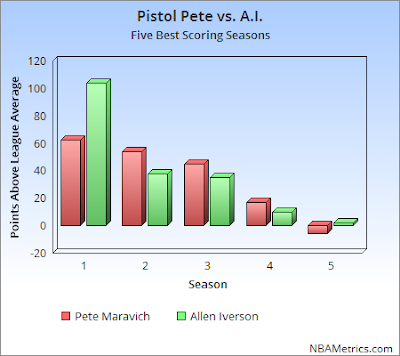 Pistol Pete led the NBA in points per game with 31 in 1977 while A.I. paced the league in points/game four times. Without accounting for shooting efficiency each appears as an elite scoring guard. Unfortuantely this isn't the case. They are both prime candidates for the "Yay Points!" all-star team (explained in depth by Chris Yeh). Over the course of their careers both Iverson and Maravich were a tick below league average shooters. Their so-so shooting combined with a high volume of shot attempts equated to one-half point per game below average for their careers. In their best shooting seasons they performed about 5% better than NBA average. The chart above shows their five best scoring seasons by Points Above League Average. Surprisingly, the best season either player had was Iverson's only full season in Denver. 2008 saw A.I. produce 104 points above average while playing with Carmelo Anthony and J.R. Smith. The former 76'er shot well from the floor while also producing a ton of points from the foul line that season. The Nuggets won an impressive 50 games in '08 before losing to the Lakers in the first-round of the playoffs.